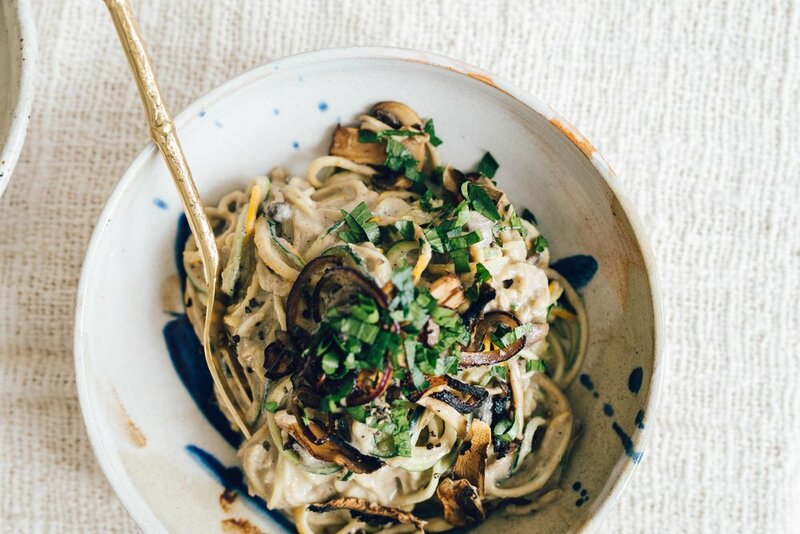 I wanted to share with you all this super delicious, easy, and healthy vegan take on a mushroom Alfredo. Obviously this Alfredo contains no butter, cream, or cheese, so its dairy free, and unlike some vegan recipe adaptions (containing margarine, processed vegan cheese), this one is actually really wholesome, so no guilt necessary! Each serving of this recipe will provide you with approximately 4 serves of veggies, which is nearly your entire vegetable intake for the day! (you should aim for more than 5 per day). Typical alfredo recipes may contain 0-1 serves of veggies. 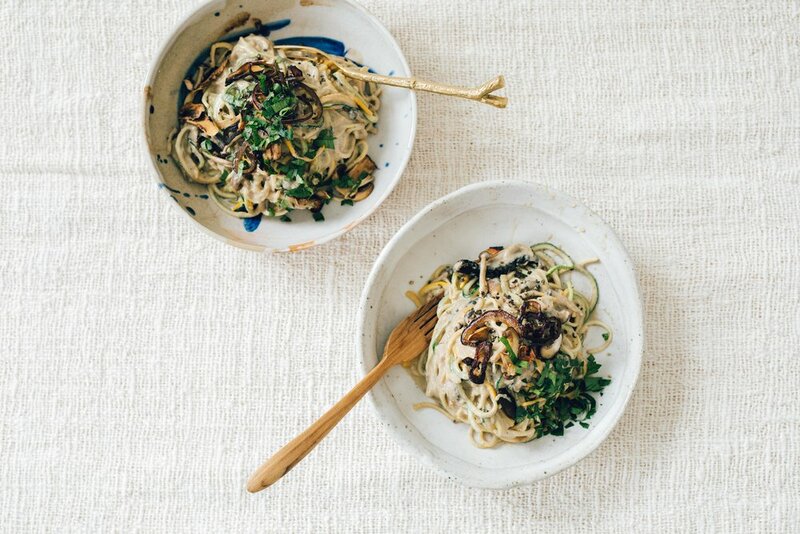 I have chosen to swap out pasta for zucchini pasta (zoodles/zucchetti) as I think its an excellent way to sneak in a tonne of extra low carb vegetables into your diet- great if you want lower calorie meals or a lighter meal but still want to feel like you're eating a nice big bowl of food. 1 medium zucchini contains ~35 calories, 1 cup cooked spaghetti contains ~ 220 calories. 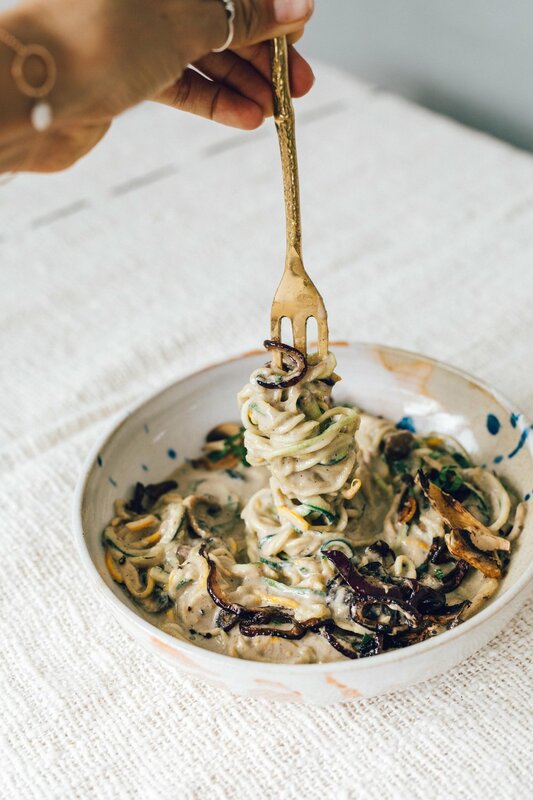 Of course, you are welcome to use regular wholewheat spaghetti instead of the zucchini if you would like something to really fill up your tummy, or try substituting half pasta half zucchini spirals if you're hesitant on trying zucchini 'pasta'. 39% Sodium RDI (933 mg) - add less salt to recipe if you are aiming for a low salt diet. Some coconut 'bacon' would also taste amazing sprinkled on top of this recipe, and i'll be working on a recipe for that over the coming weeks! Oh and if you are after a nut free recipe, try using sunflower seeds instead of cashews, or just omit the cashews all together. Pre-heat the oven to 200 degrees Celsius, fan forced. Heat a pan to medium- high heat. Add the 1/2 tbsp of olive oil to the pan with the brown onion. Fry to 1-2 minutes, stirring constantly, or until golden. Add the garlic and fry for a further 1 minute, stirring. Add the roughly chopped mushrooms to the pan and fry for 3 minutes or until softened and golden. Remove pan from heat. Add the fried mixture to a blender/food processor with the soy milk, yeast flakes, cashews, salt and pepper. Blend all ingredients until smooth. Re-heat the fry pan to medium heat, add the remaining 1 tbsp olive oil, red onion, garlic and mushrooms. Fry for 2-3 minutes stirring frequently. transfer the onion, garlic and mushrooms to a lined baking tray. Sprinkle with a generous pinch of salt and place in the oven to bake for 10 minutes or until crispy. Spiralize the zucchini's to create the low carbohydrate pasta! To re-heat the pasta sauce for serving, transfer to a pot over medium heat, stir until steaming, remove from heat. Heat the fry pan to medium heat and add the spiralized zucchinis to the pan, toss over the heat for 45 seconds to lightly soften, remove from heat. Pour the creamy pasta sauce over the 'pasta' and mix sauce through. Serve 'pasta' into bowls, remove baked mushrooms, onion and garlic from oven and sprinkle over bowls. Top with parsley and extra pepper if desired. I hope you guys love this quick healthy recipe! Let me know in the comments below if you have made it and love it or any other feedback. I love hearing from you guys! I plan to bring you a heap of new recipes this year. Oh and don't forget to subscribe to my website, you'll get a free mini-ebook of recipes on subscribing and be the first to find out about new recipes and posts!